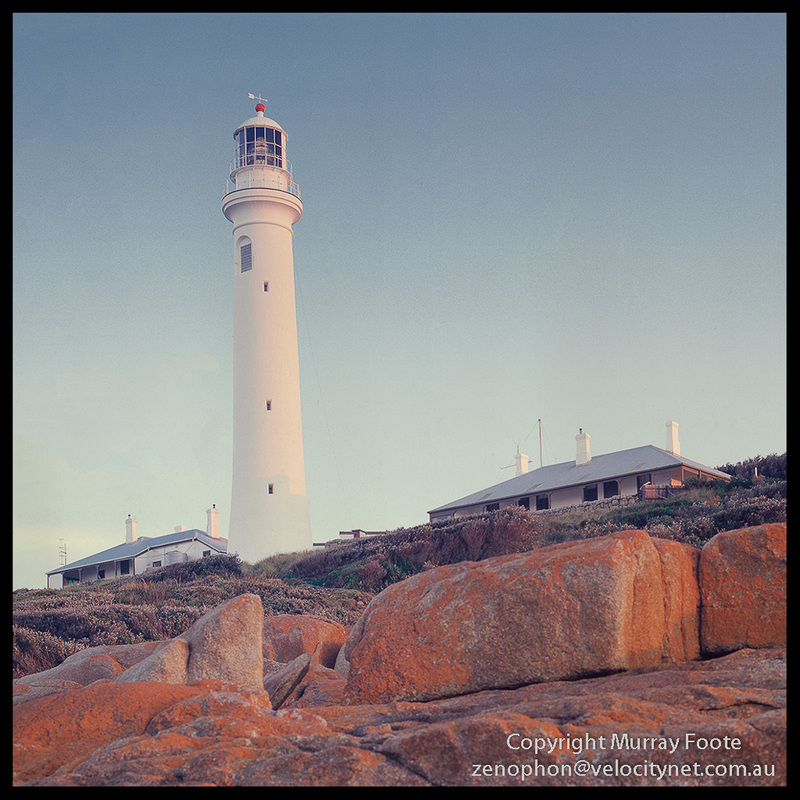 I visited Point Hicks lighthouse on 25th to 26th April 1987 and again on 17 July 1987. 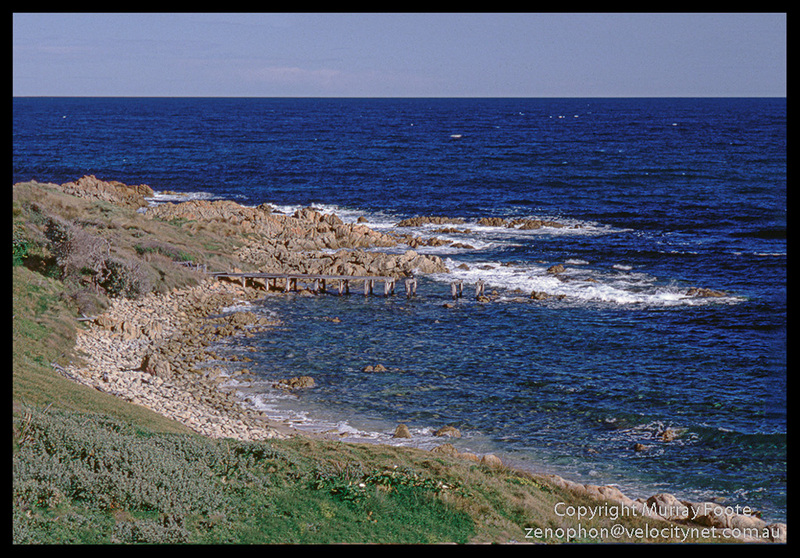 This is the historic lighthouse jetty for Point Hicks lighthouse, clearly no longer in use. This was their sole lifeline in the nineteenth century and even by the 1920s it took two days by horse to reach the nearby settlement of Cann River, only 20 kilometres away. Using the jetty may have required the high tide unless it was originally much longer. 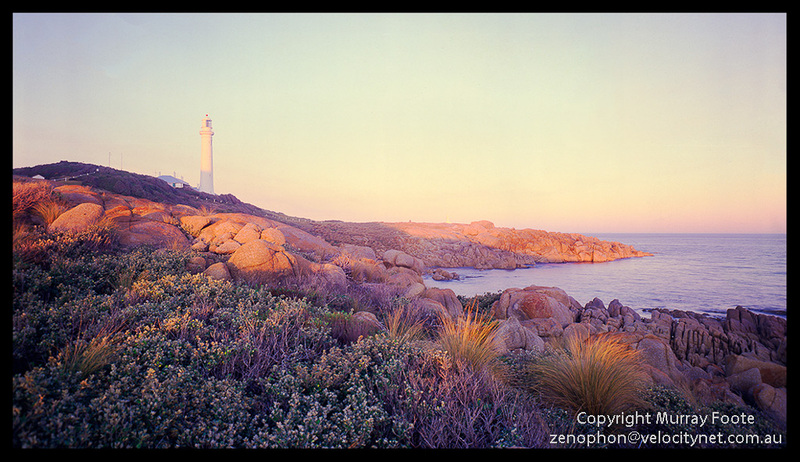 Sunset at Point Hicks on a calm autumn day in 1987. Point Hicks was the first land in Australia sighted by Cook and is named after Lieutenant Zachary Hickes, who first saw land. However, the location he gave in his log was out at sea and since no-one could determine where he had sighted land it was known as Cape Everard. Then in the 1970s, some Melbourne schoolchildren doing a project on Cook realised his log was 24 hours out and correcting for this put Pt Hicks at what was then known as Cape Everard. Consequently the name was restored to Pt Hicks. It looks calm here but if it were always like this there would probably be no lighthouse. In 1947, an assistant lighthouse keeper was taken by the sea while tending his lobster pots. This is a twenty five minute exposure by the light of the full moon and we are looking almost exactly south, which is why the stars are tracing circles. Point Hicks lighthouse in the early morning light. The lighthouse was built in 1888/89 of concrete and commenced operation in 1890. The cottages are made of wood. 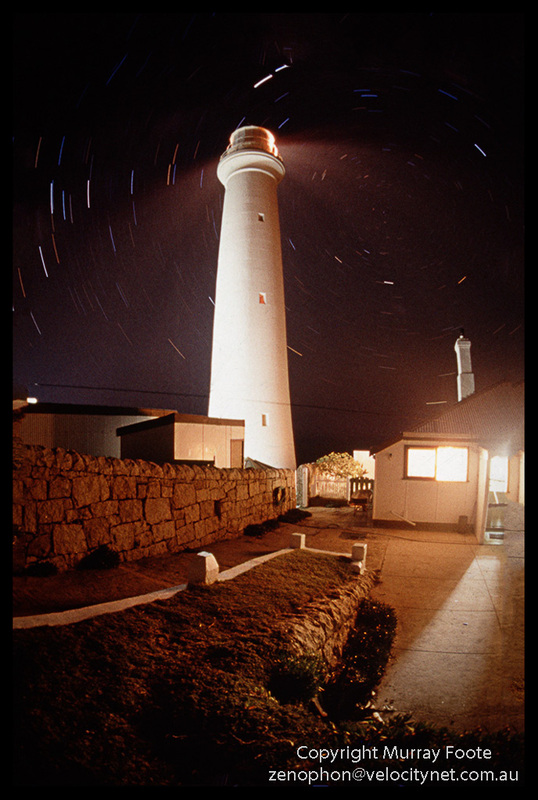 At thirty-seven metres, it is the tallest lighthouse on the Australian mainland. 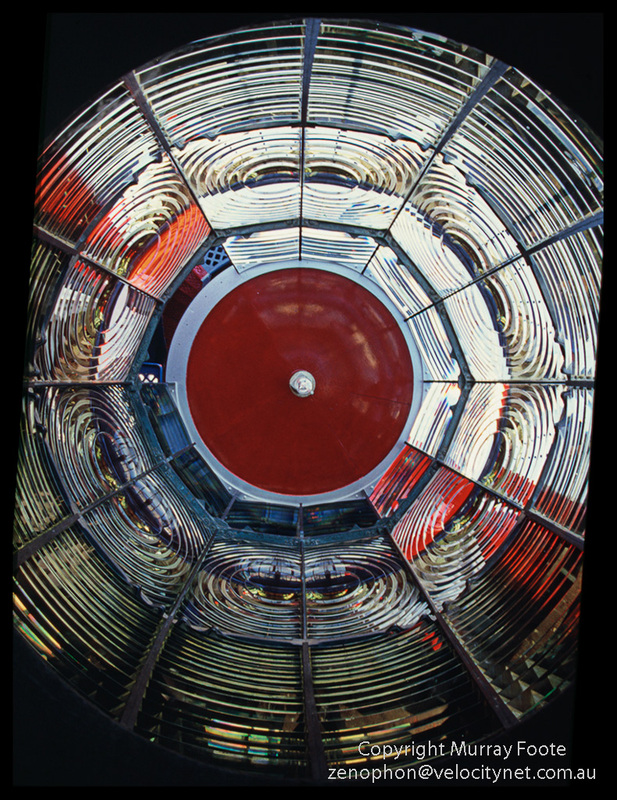 This is a view looking straight up the lighthouse from below, with illumination by daylight (from the open door on the ground floor and a window near the top). Here we are standing inside the first-order lens of Point Hicks lighthouse. As usual, the view through is upside down, with the clouds on the bottom and the sea on the top. The glass is red over to the left because if the mariners can see that, they are on a dangerous bearing. This is looking down on the lens from above. We are still inside the lantern room at the top of the lighthouse. 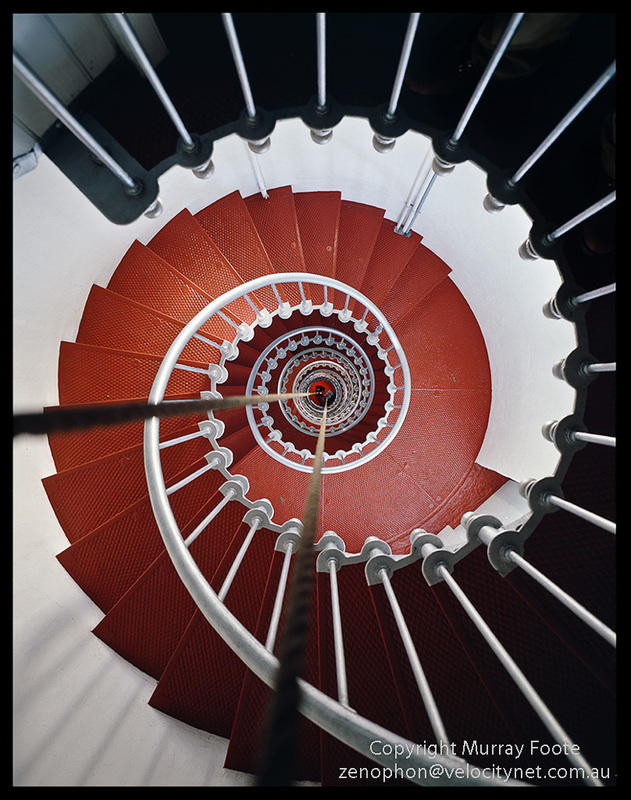 This is another view looking straight up the stairwell of the lighthouse but the door is now closed and ground floor illumination is by artificial light. The lighting further up is still daylight. 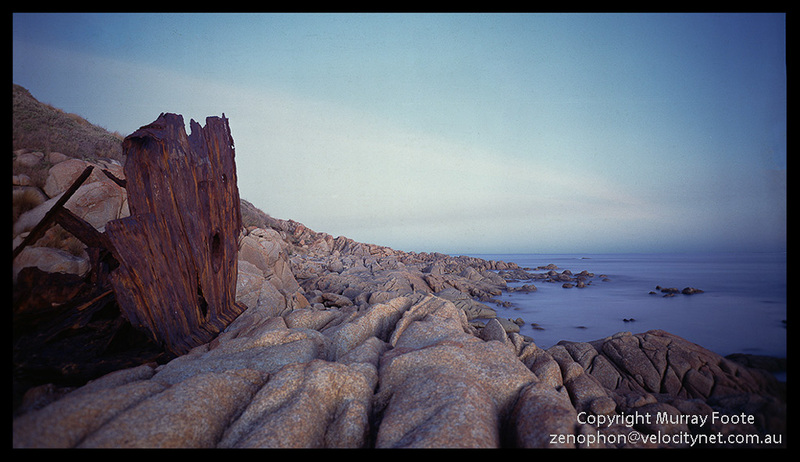 This is an image from a large format camera rather than the previous fisheye image on 35mm film. The remains of the bow of the S.S. Faros, which sunk nearby in 1937. All passengers and crew were saved. The lighthouse keeper told me the ship originally sunk in the sea and the bow we see here washed up some years later on these rocks during another storm. This is a twenty-minute exposure. By the time I had finished it was dark and neither of us had brought a torch. We had to gingerly pick our way back over the rocks. Finally, here is an exposure I took when I came back for the second time. It took me quite some time to set up the view camera on my heavy Manfrotto 85B tripod, centred in the tower and with the tripod tied in place for good measure. There was too much light coming in the window from the level just below us so the keeper hung a sheet over it. You can see him down the bottom of the tower and his name is Chris Richter. 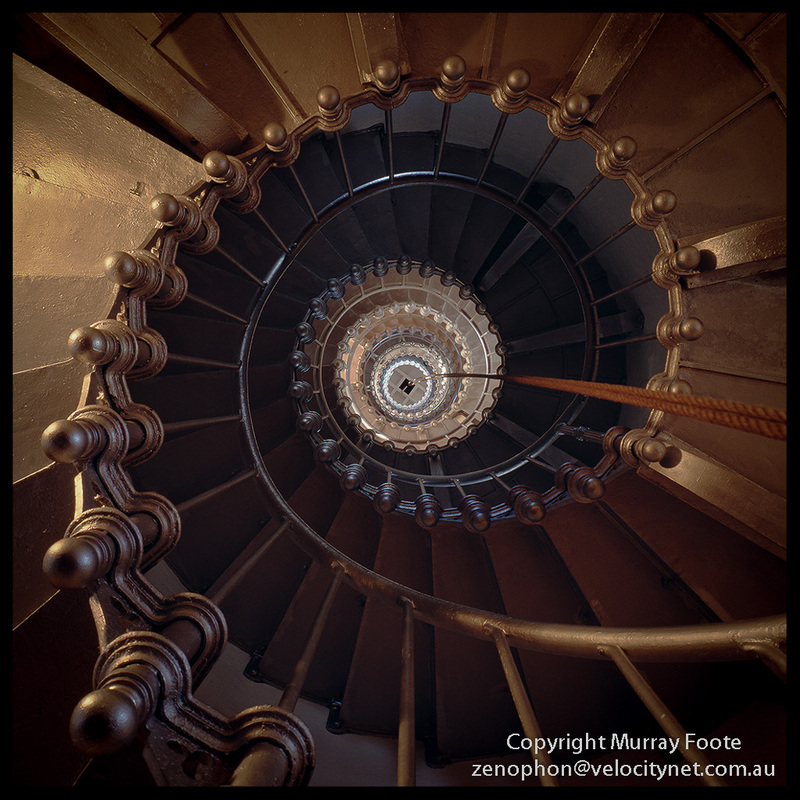 In the early days of the lighthouse, the light was rotated by a clockwork mechanism in turn powered by a weight that slowly dropped down the tower. Every now and then the keepers had to wind the weight back up again from the lantern room, which may have kept them fit just doing that. When the clockwork mechanism was converted to electric, a block and tackle was installed instead so the keepers could lift heavy weights up to the top, as we see here. 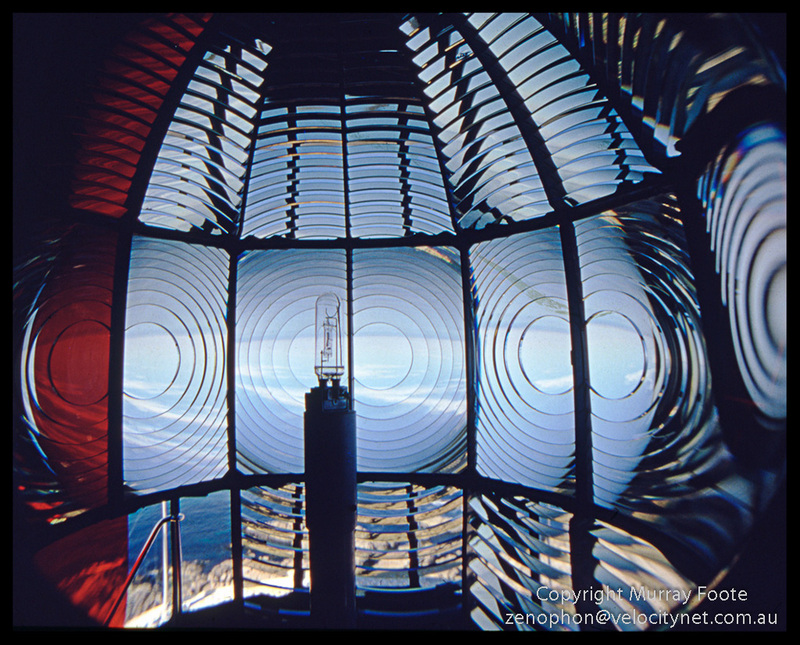 (Note of trivia: With this post we’ve passed 100 lighthouse images and 2,000 images for the Blog). This entry was posted in Australia, From Dusk Till Dawn and tagged Architecture, Australia, History, Landscape, Lighthouses, Photography, Point Hicks, seascape, Travel, Victoria. 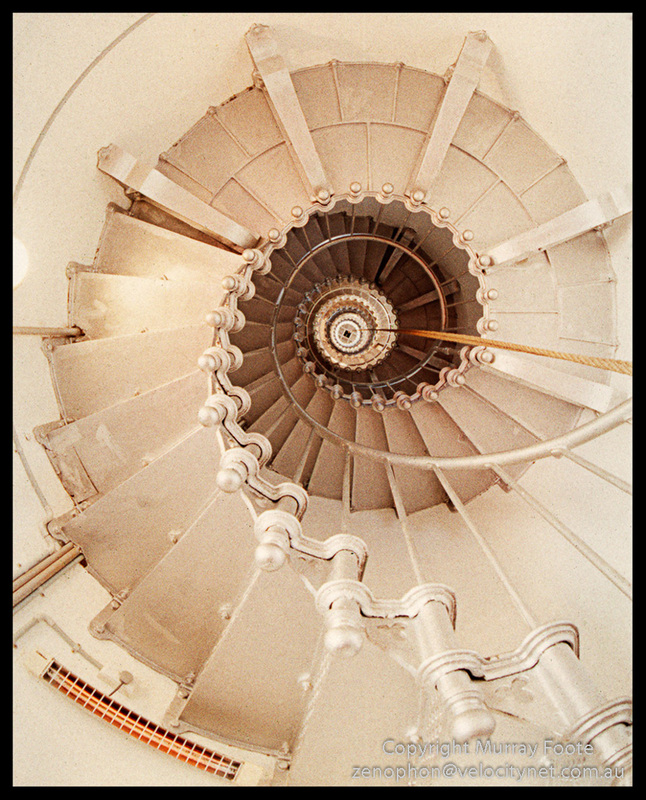 Those stairwells remind me of the nautilus shell. Perfect proportions, just wonderful.